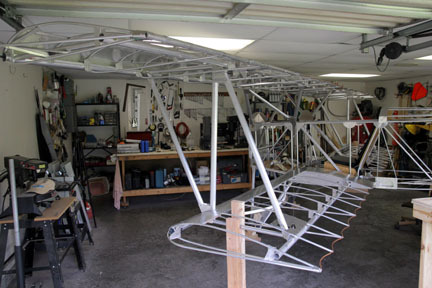 The airframe is rigged with the exception of fabrication of cables. It has been interesting to put all the pieces together for the first time. 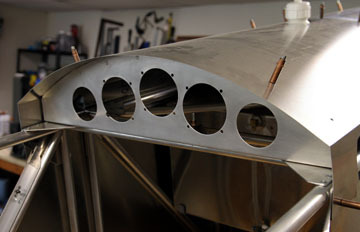 Up to this point I have been building aircraft parts--now it is enjoyable to work on an airplane. I found some areas where tweaking was needed in order to get things to fit as I wished. But overall first assembly went well and the plane is quite straight. All the instruments are in hand so it was time for a panel mockup. I laid the instruments face down on a scanner and made paper dolls to use as a cut-n-paste panel. 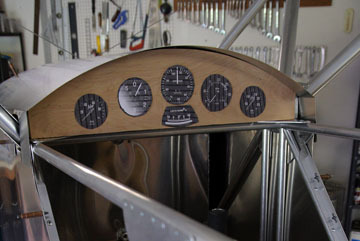 It is a simple panel and appears to have adequate real estate for all the instruments. Here is the slip ball indicator I will be using. Can't beat the price....about $20 for the pair. 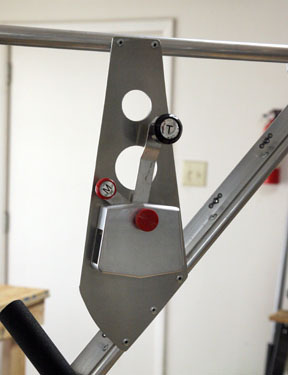 A bracket was fabricated to support the ASC throttle/mixture quadrant. 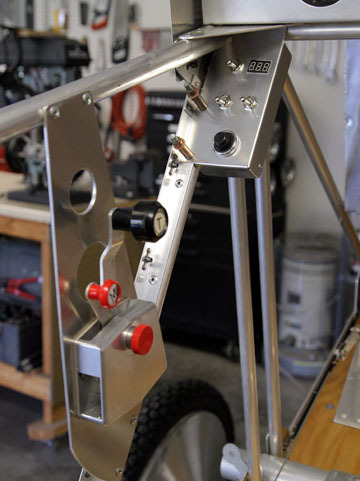 There is no kit documentation on how to finish the fuel tank filler neck. I didn't want to resort to sending the tank out for welding on a cap flange so it was off to the local Lowes for a solution. A 1.5" PVC pipe will fit snugly into the filler neck if a few thousandths are sanded off. This is barely visible in the photo. 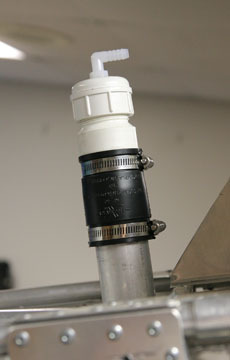 A 1.5" flex coupling forms a very tight seal and a threaded adapter allows the use of a threaded PVC cap for a fuel cap. The flex coupling needs to be the type that is smooth all the way through instead of one with a flange inside. A bit of Teflon lube and some persuasion makes it slide down over the tank neck. 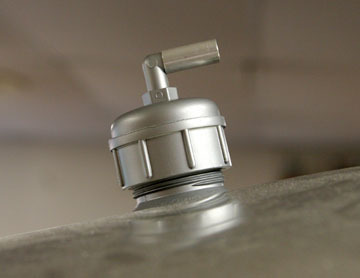 The cap is vented with a nylon el with 1/4" NPT threads. I drilled a hole nearly large enough to the threaded end, then "tapped" it with a brass 1/4" NPT fitting. The nylon el then threaded snugly down into the hole. 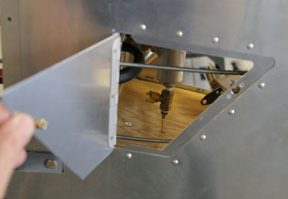 The adapter will be clocked to where the cap will tighten down with the vent facing forward. Only the cap protrudes above the turtle deck and after paint this filler will look very adequate. This entire assembly can be easily replaced with new parts from the local Lowes if service problems ever arise. Paint and a length of 1/2" aluminum tube slipped over the vent barbs finish the fuel cap. With all the instruments in hand, there was no reason not to cut the panel. I don't like using a fly-cutter, but it was the best option I had for cutting the holes. The key to avoiding making a mess or getting injured is to have the work securely clamped so it can't become a projectile. 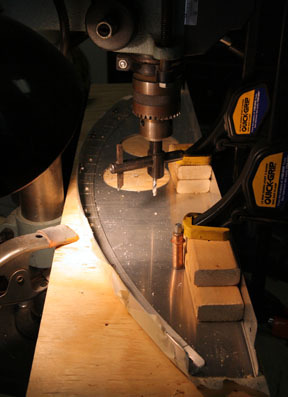 The holes were carefully laid out according to the plywood mock-up and pilot holes drilled. The actual cutting occurred without mishap. 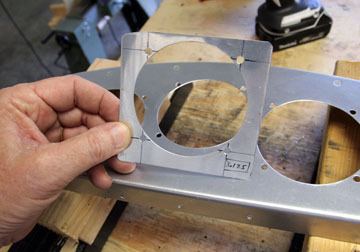 This is a test piece to make sure the fly cutter was set properly. 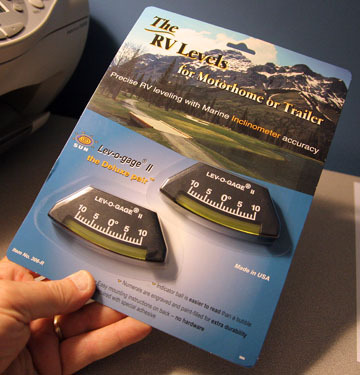 I kept it and made a drill guide to assure the screw holes were located properly. The panel is ready for finish. It will either be painted or overlaid with a wood veneer. Here is the switch panel for Master, Lf Mag, Rt Mag, and Starter. The only concession to digital is the little voltmeter that will monitor the health of the starter battery. 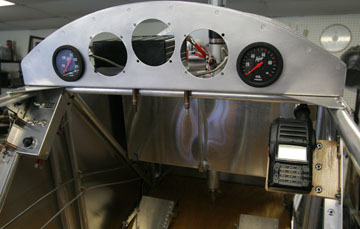 A carb heat control will soon be located below the quadrant. The little Vertex handheld radio I've used for a few years will be pressed into service in the Fokker. I made a plywood bracket for it and attached it via an aluminum angle to a fuse diagonal tube. 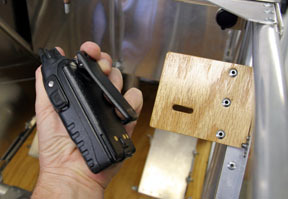 A slot in the bracket captures the spring-loaded belt clip on the radio. 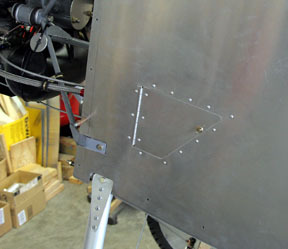 An access door is needed to reach the fuel tank sump drain valve. This allows the tank to be sumped during pre-flight.